This is another activity that might require some explanation. The best description I've heard so far is that it's "a bit like water skiing, but on a board". So there's no sail, there's no paraglider-type wing, just a boat and a tow rope. The boat pulls you along, you hold the rope and (hopefully) stand up on the board, with a snowboarding-like stance. 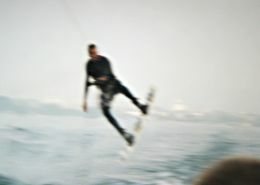 The 'wake' part of the name comes from the shaped plume of water behind the boat, which the experts use as a ready-made jump ramp for their fancy tricks and spins. But let's take things one step at a time, shall we? First of all, you need to find a local place that offers beginners' courses. Have a chat to them about their facilities, because some places are really only geared up for club members, rather than basic tuition. At the Wakeboarding Academy here in Zurich (see details later), they offer a special beginners' deal, but confusingly this is sold at a higher price than a usual lesson, not as an attractive beginners' discount. But still, the package advertises more instruction than a regular session, and gives some reassurance that they'll go easy on you! So, having turned up, what can you expect? And so it was, that I found myself sitting on the back of the (very nice) boat, with wetsuit and life jacket on, strapping myself in to the bindings of the board. The board itself is surprisingly short, and much squarer than a surfboard, with small fins underneath for stability. The bindings are like padded neoprene, with velcro straps holding your feet firmly but comfortably in place. Obviously the most important bit of the instruction is how to start off, and how to avoid funnelling the water with either your face or your behind. I was surprised how little instruction was required (keep your arms straight, keep your knees bent and the rope low, don't try to stand up too early), but it seemed to be enough because when he gradually applied the boat's power, sure enough I was up and standing! I have to say I didn't expect it to be so easy. 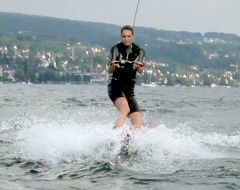 Once I was up, the board seemed surprisingly stable, and with my right-footed stance I was more or less automatically lined up on the clear part of the lake to the right-hand side of the wake. With the boat gathering a bit more speed, my grin widened, and I could control my angle, either just beside the churning wake or a fair distance out to the side. This was travelling in style. Next step was to see if I could cross the wake and get out to the other clear area on the other side. Which turned out to be a bit more tricky, and brought the first spill. But even that wasn't as painful as I had feared, as my speed wasn't very high. And fortunately the Zürichsee doesn't taste too bad! After the boat wheeled around, I got some more advice and pretty soon I was up again, and getting a little bolder. By the end of the first lesson (which was around 20 minutes), and after many crashes, I could get across from side to side fairly consistently (if at very low speed! ), and even got as far as a tentative (but unsuccessful!) hop on the wake. This was more than I expected from my first short session, and I was pleased that I could translate at least some of my snowboarding (especially practice on the drag lifts) over onto the water. So overall, I found it very enjoyable, and although I was still keen to do more at the end, it was tiring and caused much aching the following day! After the beginner's lesson, the next step is obviously just more lessons of a fairly similar format. As I said, for some strange reason at the place I took my lesson, the beginners pay more, so it's CHF 60 for the first go, and CHF 50 after that. Effectively that's CHF 10 for them going a bit easier on you and a bonus free drink. Tip: For first-timers, pretend you've done it before, and bring your own drink. And try to get Aussie Paul as your boat driver, as he'll give you all the advice anyway. In your next sessions, you can obviously get a bit bolder with the wake, and build up some speed from side to side. Or try fast little carves around the centre of the wake, where it's flatter. (Actually the wake is more like two ridges, with a calm bit inbetween) You can also draw on your snowboarding skills to flip little 180s if you're showing off. It's best to try to get flat, calm conditions if you can, as it makes the whole thing much easier (especially the starting off), and less tiring. Tip: There are far more boats on the Zürichsee at the weekend than during the week, and they all contribute to the waves. Apparently weekday mornings have much better conditions. 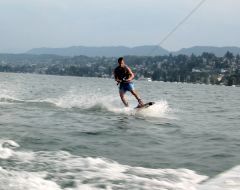 I used the Wakeboard Academy, based near Wollishofen on the West side of the Zürichsee. It is affiliated to the Snowboard Garage, where you can find out some more information. To book a session, phone up a few days beforehand (email doesn't work at present). To get there from Zürich, take the 161 or 165 bus South from Bürkliplatz to Stadtgrenze (on the edge of zone 10). I found it to be quite a friendly little club, with good quality equipment (especially the boats! ), the only down-side being the changing facilities. These are basically the campsite showers, and are closed in the vital hours of noon till 3pm. But apart from that, it's a nice setup, with plenty of sunny seating for chatting inbetween rides. The campsite next door is Camping Seebucht, should you need it. And you can use their GPS coordinates to find the Wakeboard Academy too. Finally, some half-decent pics to go with the awful blurry ones. Thanks for your patience. Don't miss the excellent wakeworld.com, and if you're in the UK, there's a good directory of places at wakeboarding.co.uk. I have heard that the Quayside centre near Farnborough has a good reputation, but I personally found them rather unhelpful and not too friendly when I tried to take a beginner's lesson there. Page last updated June 2003. Feedback welcome at mail@activityworkshop.net.